Express understanding for the child’s feelings. Be sure to check with him to see if you are right. Show empathy without condoning. Empathy does not mean you agree or condone. It simply means you understand the child’s perception. Share a time when you have felt or behaved similarly. Share your feelings and perceptions. If the first two steps have been done in a sincere and friendly manner, you will have created a connection and the child will be ready to listen to you. Invite the child to focus on a solution. Ask if he has any ideas on what to do in the future to avoid the problem. If he doesn’t, offer some suggestions. After making a list of several solutions, choose one that feels helpful to both of you. An attitude of friendliness, caring, and respect are essential to these steps. Your decision to create a connection will be enough to create positive feelings in you. After the first two steps, the child will be won over, too. He will now be ready to hear you when you use the third step (even if you may have expressed your feelings many times before without being heard.) 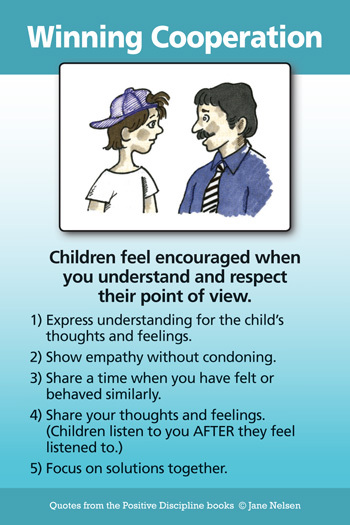 The fourth step —(invite the child to focus on a solution) is likely to be effective now that you have created an atmosphere of respect. Mrs. Martinez shared the following experience where she first created distance and hostility and then used the four steps for wining cooperation to correct her mistake and create closeness and trust. Her daughter, Linda, came home from school complaining that her teacher had yelled at her in front of the whole class. Mrs. Martinez put her hands on her hips and asked Linda in an accusing voice, "Well, what did you do?" Linda dropped her eyes and angrily replied, "I didn’t do anything." Mrs. Martinez said, "Oh, come on, teachers don’t yell at students for nothing. What did you do?" Linda flopped on the couch with a sullen look on her face and just glared at her mother. Mrs. Martinez continued in her accusing tone, "Well, what are you going to do to solve this problem?" Linda belligerently replied, "Nothing." Linda was interested now. "Really?" she said, "All I did was ask to borrow a pencil. I certainly didn’t think it was fair for my teacher to yell at me for that." Mrs. Martinez said, "Well, I can certainly understand how you must have felt. Can you think of anything you might do to avoid that kind of embarrassing situation in the future?" (Step 4. Invite child to focus on a solution. Step 3 was not necessary in this case.) Linda responded, "I suppose I could be sure I had more than one pencil, so I would not have to borrow." Mrs. Martinez said, "That sounds like an excellent idea." One of Mrs. Martinez’s goals was to help Linda behave in ways that would not invite her teacher’s anger and disapproval. Notice that the first time she invited Linda to think about what she could do to solve the problem; Linda was feeling too hostile to cooperate. Once her mother used encouragement to create a connection (through the Four Steps for Winning Cooperation), Linda felt closeness and trust instead of distance and hostility,and was willing to think of a solution. When her mother was able to see things from Linda’s point of view, Linda no longer felt the need to be defensive. Mrs. Jones also used the Four Steps for Winning Cooperation when she learned that her six-year-old son, Jeff, had been stealing. She found a quiet time when no one else was around and asked Jeff to come sit on her lap—a great way to create connection. She then told Jeff she had heard about him stealing a pack of gum from the store. (Notice she didn’t "set him up" by asking him if he had done something when she already knew he had.) Next she shared a time when she was in the fifth grade and had stolen an eraser from a store; she knew she shouldn’t have done it, and it made her feel very guilty, so she decided it wasn’t worth it. Jeff said defensively, "But the store has so much gum." Mrs. Jones then led Jeff in a discussion exploring how much gum and other merchandise the store owner had to sell in order to pay his rent, pay employees, pay for inventory, and earn enough money to live on. Jeff admitted he had never thought of that. They also discussed how they wouldn’t like to have others take their things. Jeff confided he did not want to steal things anymore, and that he would pay for the gum he had stolen. Mrs. Jones offered to go with him for moral support. Mrs. Jones was able to create a connection and win Jeff over by not accusing, blaming, or lecturing. Jeff did not have to feel he was a bad person for what he had done, and he was willing to explore socially responsible reasons for not doing it again. Also, he was able to participate in a solution that, although embarrassing for him, would be a very valuable life lesson for future behavior. He was able to do this because his mother created a feeling of support rather than attack and defensiveness. The feeling behind words is often most evident in our tone of voice. Adding humiliation violates the basic concept of mutual respect. It also changes what could be a logical consequence into punishment, which won’t achieve positive long-term effects. If a child spills milk on the floor, the logical solution would be for her to clean it up. It remains a logical solution so long as the adult engages the child through kind but firm words, such as "Whoops, what do you need to do about that?" (Notice how much more engaging it is to ask the child what she needs to do instead of telling her what she needs to do. Asking instead of telling is one of the most effective Positive Discipline methods you will learn and is discussed in more detail in Chapter Six. Telling invites resistance and rebellion. Respectfully involving children invites them to feel capable and to use their power in contributing ways. A request becomes a punishment when adults don’t use a tone of voice that is kind and respectful or adds humiliation, such as, "How can you be so clumsy? Clean that up right now, and let me pour the milk from now on since you can’t seem to get it right." Adlerian psychology provides a set of basic concepts that offer a wealth of knowledge to help us increase our understanding of children and of ourselves, but it is so much more than just theory. The basic concepts are lost without attitudes of encouragement, understanding, and respect. If these attitudes are not understood, the techniques will be reduced to disrespectful manipulation. We will be more effective with children if we always ask ourselves, "Is what I am doing empowering or discouraging?" Have I taken the time to create a connection before attempting correction?